Prayer Rugs at the Mexican Border: How Important? This article was previously published by the Center for Immigration Studies under the title "Notes on Prayer Rugs". 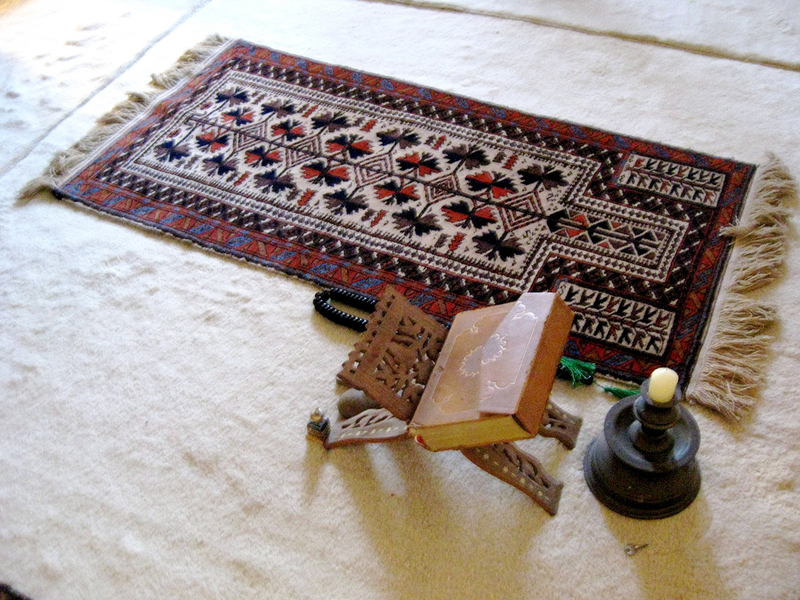 A prayer space in a Muslim house includes a traditional prayer rug, the Qur'an and prayer beads. Last week, another firefight broke out over migration from Islamic countries to the U.S. southern border. This one was over President Trump's rather casual Twitter observation that, sort of interestingly, a media report said prayer rugs were found on the Mexico-New Mexico border. He obviously saw this report as a small, handy reminder of his mantra that border security is also national security. The president's opponents lost their minds. Many of them saw the thing about prayer rugs as "trace evidence" of an as-yet-unproven suspected phenomenon or presence, like when hunters find the tracks of prey they hadn't previously known inhabited the area. This was a silly, needless discussion that proves only one thing: the extent to which the American people, the media, and elected leaders remain ignorant about migration from Islamic countries despite overwhelming, prevalent, documented evidence to the contrary that has been in the public realm for at least a dozen years. But still, for reasons unknowable, it just won't permeate. The pundits who responded so energetically to the president's casual citation of a news article need prayer rugs to prove the presence of border migration from Islamic nations about as much as astronauts orbiting the planet need Eratosthenes's calculations to know the Earth is round. Their fury went straight to Eratosthenes rather than to the orbiting astronauts on a question asked and answered a long time ago already. Outlets penned whole articles dedicated to wrongly stating that such migration isn't happening or, as one in Vox stated, was happening "at vanishingly small rates". A Washington Post piece said of the prayer rug report, in raising the prospect that Islamic nation migrants were reaching the border, that it was "similar to the claims of a conspiracy theory that has long been popular with the far-right and anti-Muslim figures and publications." The Post writer even went to the research length of listing "prayer rug rumors, their debunking, and their reanimation during border security conversations over the years." The overwhelming gist of all the blowback was "Trump Lied Again!" and that it's not true migrants from Muslim-majority countries cross the southern border or that it's a national security issue. But as I pointed out in a posting here very recently, that perception runs into the brick wall of facts on the ground and President Barack Obama's DHS Secretary Jeh Johnson, who believed the threat of land border-crossing migration from Islamic countries had become so grave by 2016 that he ordered a massive, government-wide initiative to counter it. We have long known that thousands of migrants from places where prayer rugs are used make it to the U.S. Southwest border every year because we have physically and personally met them. We no longer need to cite tracks in the dust or prayer rugs and then have arguments about trace evidence. Because reporters (like me) have found actual live migrants from those places and interviewed them. Because homeland security professionals conduct interviews with them every week in ICE detention facilities. Because immigration lawyers and judges deal with hundreds of such migrants all year, every year. And because the government often publishes the numbers and nationalities of migrants from Islamic countries that show they consistently number between 3,000 and 4,000 annually. The extent to which this flow is a terror threat, as both Obama's Democratic DHS Secretary Jeh Johnson and as a GOP-controlled House Homeland Security Committee task force firmly believed, is definitely a worthy debate to have. But certainly not about whether the migration is even happening. As long ago as 2007, I documented this migration by interviewing Iraqis at the border and on their way for a series of stories called "Breaching America" that Sen. John Cornyn entered into the Congressional Record. In those dark days, all the American public had was pretty much prayer rugs and trace evidence. America's pundits and reporters are stuck there even though just last month, the Center for Immigration Studies sent me to Panama, where I found, interviewed, videotaped, and photographed migrants from countries where prayer rugs are ubiquitous. And while it may be true that only one border-crossing migrant from Somalia has committed a vehicle-ramming attack (in Canada) so far, too many suspected terrorists have been caught at the southern border since 9/11 and also en route to it, since all it takes is a few to cause upheaval. Crossings by dozens of suspected terrorists and those on watch lists are well-documented, too (see here and here). And while it's certainly fair game to argue over whether the connective smuggling bridges from there to here should be ignored as a non-terror threat, or deeply monitored and disrupted per the Democrat Secretary Johnson, and to what degree, there's no doubt the bridge exists and is in current use.